I'm a huge fan of Instapaper, a fantastic free iPhone app that clips and reformats online content for later viewing on my iPhone. Let's say you're at your desk. 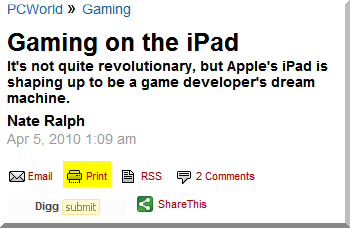 You've just started reading PCWorld's Gaming on the iPad feature, when suddenly you realize you've got a train to catch. No problem: Just click Instapaper's Read Later bookmarklet, then head for the station. The next time you fire up the Instapaper app on your iPhone, you'll see that exact feature--downloaded, reformatted, and ready for reading. Awesome, right? Actually, there is one tiny problem: Instapaper doesn't do well with multi-page articles. Once you've reached the end of the first page in Instapaper, you have to tap a link to move on to the second--at which point Instapaper dumps you into the Safari browser. Translation: No more lovely iPhone-friendly formatting. The developer says he's "working on improving this for the future." In the meantime, here's a workaround: Before you click Read Later in your browser, look for a Print or Printer Friendly option on that page, as you see in this screen shot. That'll produce a single-page version of the story, and that's when you click Read Later. Presto! Now you've got the whole story ready for mobile consumption. This won't work everywhere; not every site offers a printer-friendly reading option. ("Entertainment Weekly," I'm looking at you.) But I've had success using this tip on many sites across the Web. Give it a try! My wife's laptop suffers from a seriously annoying problem: Sometimes print jobs get stuck in the queue. I'm not sure if this is the result of a driver issue or the fact that she's using a Wi-Fi connection to the printer--could be both. Even more vexing, Windows won't let us delete a stuck print job, which blocks subsequent items from printing. (Talk about something that should have been fixed back in XP days, Microsoft.) Usually the only solution is a reboot, and no one should have to endure that kind of a hassle just to print a document. Salvation! 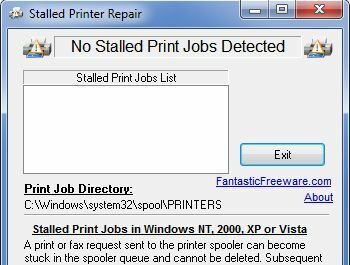 Stalled Printer Repair is a free utility that detects and repairs stuck print jobs. Actually, it purges any stuck jobs it finds, meaning you should be able to resume printing again right away. If you've been plagued by stuck print jobs, I definitely recommend giving Stalled Printer Repair a try. One of life's biggest hassles is not limited to the PC: It's the challenge of how best to share everyone's photos and videos after a vacation, wedding, party, or other group event. There are countless services that can aggregate and organize all this stuff, but I've yet to find one I like as much as the unfortunately named Shwup. All you do is sign up for an account, then import your media from your PC and/or Facebook, Flickr, iPhoto, and Picasa account(s). Shwup can also retrieve images from just about any URL. Meanwhile, you can invite friends and family members by entering their addresses manually or tapping into your AOL, Facebook, Gmail, and/or Windows Live account(s). Shwup also can import address books exported from programs like Microsoft Outlook. What's nice is that your invitees can view your album, add their own photos and videos, and leave comments, all without signing up for the service themselves. In fact, adding photos is as easy as attaching them to the invitation reply. I know that'll be a big draw in my circle, as my friends and family positively hate having to sign up for yet another service. For $3.95, you get the photos in their original resolutions. And $14.95 will buy you a DVD archive, a decidedly gift-able item. I particularly like Shwup's Muvee integration, which can turn an album's worth of photos and video clips into a nifty music video--not unlike the Animoto service I mentioned last week. Pretty sweet. Bottom line: If you've yet to find a service that really encourages friends and family members to share their photos, give Shwup a try. Of course, if you've found something better, by all means tell me about it in the comments.